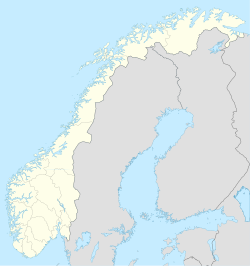 Laukhella is a village in Lenvik Municipality in Troms county, Norway. The village lies to the west of the village of Silsand on the island of Senja. It is located along the Laksfjorden, about 5 km (3.1 mi) west of the town of Finnsnes. The village and surrounding area is home to several hundred people, and one major local industry is a prefabricated house factory. Islandsbotn stadium is also here, which is the home field of the FK Senja football team. ^ "Laukhella" (in Norwegian). yr.no. Retrieved 2012-12-07. ^ Statistisk sentralbyrå (2001). "Folke- og boligtellingen 2001, kommune- og bydelshefter 1931 Lenvik" (PDF) (in Norwegian). This page was last edited on 27 August 2018, at 01:30 (UTC).